THE ADA/ HISTORIC DEERFIELD ANTIQUES SHOW is on the move to the beautiful Hartford State Armory. 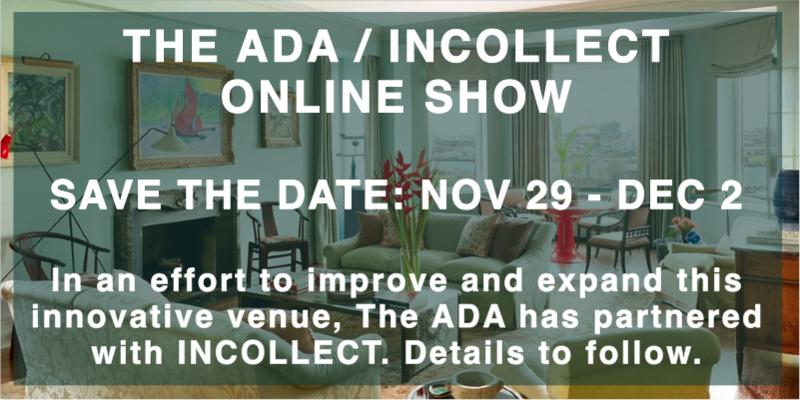 Collectors have been coming to the Hartford Armory for years and this historic location will serve The ADA and its' diverse dealers a great stage to showcase the quality and depth of its' membership. The ADA/Historic Deerfield Antiques Show has a reputation of providing its customers with an enjoyable and informative experience in antiquing. The show's comfortable atmosphere allows customers to ask questions and spend time with the objects—and being an ADA event, each item is sold with a guarantee of authenticity! An exciting addition to the show this year is that a number of major Connecticut Museums will have booths. To date we have: The Wadsworth Atheneum, The Slater Memorial Museum, The Florence Griswold Museum, The Litchfield Historical Society, The New Britain Museum of American Art, The Hill-Stead Museum, Connecticut Historical Society, American Clock & Watch Museum, Mark Twain House & Museum, Haddam Historical Society and The Mattatuck Museum participating in the show. Karen and Ralph DiSaia, Oriental Rugs, Ltd. I am pleased to extend an invitation to you to attend the 2018 ADA/Historic Deerfield Antiques Show. We are excited to see the show in the Hartford Armory this year and to work with a new partner, the Connecticut Humane Society, in bringing the show to new audiences in the region. This annual celebration of antiques and decorative arts is one of the most highly regarded shows on the East Coast. For many years the show was held in the village that is home to our museum of early American life in Old Deerfield, Massachusetts. Many of the antiques for sale at the show are similar to items on display in Historic Deerfield. You can learn more about their history on a visit to Deerfield, whether by seeing them displayed in one of our historic homes, or by visiting The Flynt Center of Early New England Life, where thousands of objects in our extensive collection are on view. Take a moment to visit our website at www.historic-deerfield.org to start planning your visit. From 91 South take Exit 29A / From 91 North take Exit 29A / From 84 East take Exit 48B / From 84 West take Exit 48 / Route 9 North to I 84 East / Route 2 West to I 84 West and follow the signs to the show.